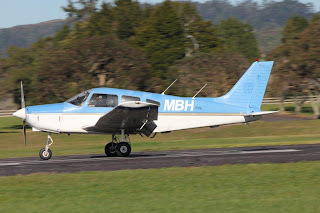 Northern Air was the trading name of North Island Air Services Ltd a private company established by Keith Madden and Dave McAlister and incorporated on the 4th of April 1995. Northern Air started life as a charter operator, flying school and aircraft sales centre but with a particular focus in offering scenic tours for international travellers who only had a few days break in New Zealand and in training pilots from the start to being ready to enter directly into a commercial operation. 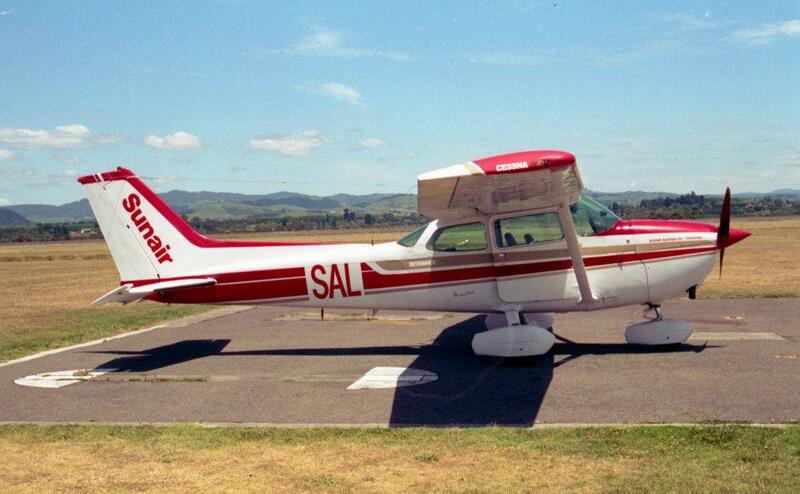 Cessna 177B Cardinal, ZK-DJK, at Auckland on 10 November 1996. 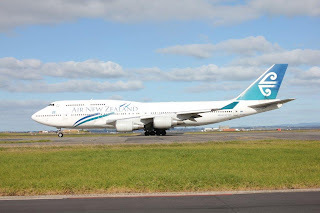 The company commenced operating from Auckland to Great Barrier Island in competition with Great Barrier Airlines and Air National’s Great Barrier Express during winter 1996. 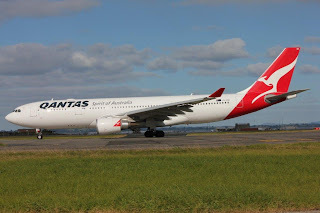 Initially the service operated five days a week, with a single return flight offered on Mondays and Fridays and two return flights offered on Wednesdays, Saturdays and Sundays. 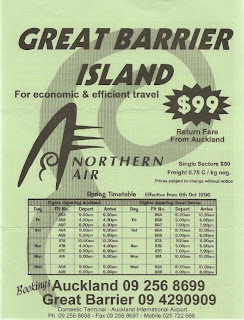 By the end of the 1996 the timetable had been increased to two daily return flights offered from Auckland early in the morning and late in the afternoon. 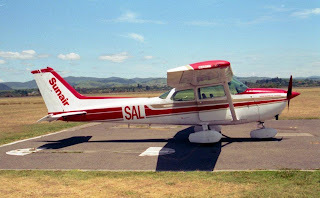 Cessna U206C Stationair ZK-JCB at Auckland on 8 March 1997.
airline which branded its timetables with “fly the friendly airline” or “for economic or efficient travel” told the Barrier Bulletin that it “aims to offer standard economical fares with no strings attached.” Northern Air operated a variety of single-engined and twin-engined aircraft in its fleet and each day the aircraft to be used for that day was selected in response to the passengers offering. 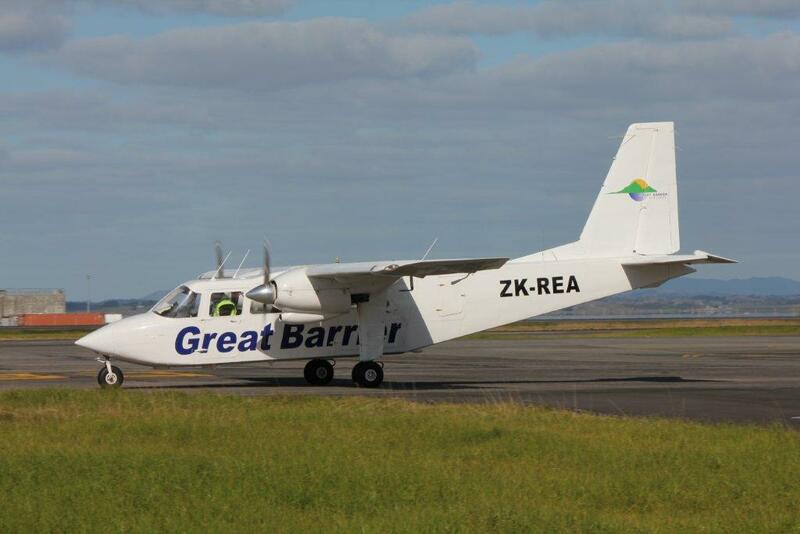 The company sought to offer the cheapest fares possible to the island and as a launch incentive offered flights for $78 for Great Barrier Island residents. A flight centre was built at Claris airfield with building materials being transported to the island in the company’s Nomad. The friendly airline expected friendly passengers - check out the condition marked! In addition to the Great Barrier run Northern Air took over The Air Charter Company’s courier service in October 1997. The courier run saw an early morning flight from depart from Auckland for Tauranga, Rotorua and Taupo. 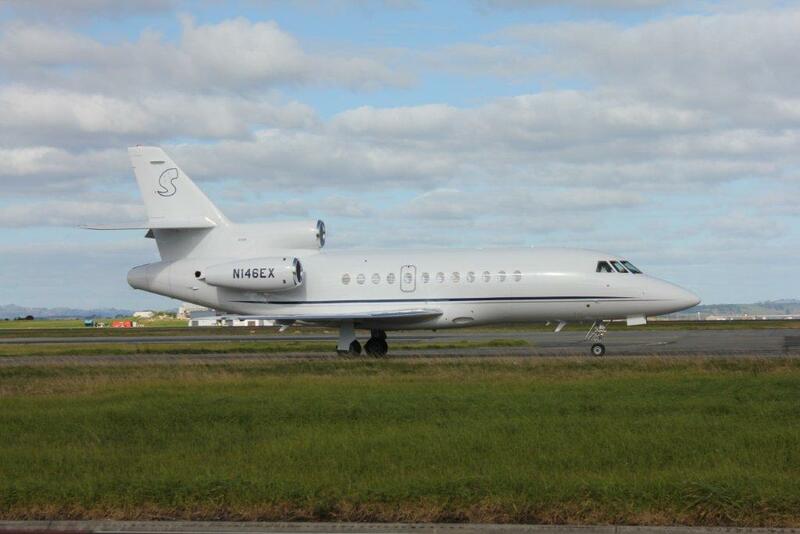 In the evening the aircraft returned to Auckland from Taupo via Rotorua, and Hamilton. 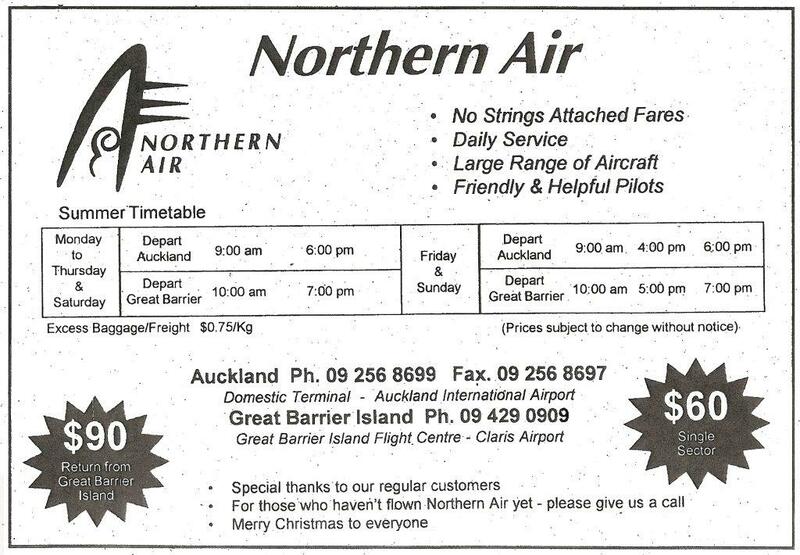 There was a real dogfight on the Auckland-Claris service during the years Northern Air operated. 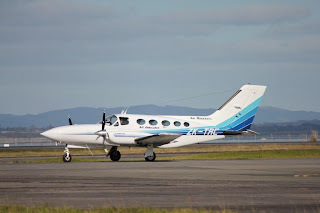 During this time Air National’s Great Barrier Express service ceased and Trans Island Air’s Cessna Grand Caravan service started and ended. The competition it experienced from Great Barrier Airlines and later Mountain Air, however, was too much. 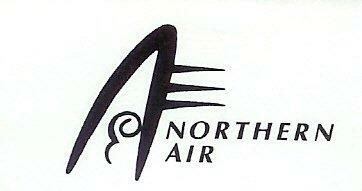 This and in-house fighting forced Northern Air to cease operating its air services in November 1998. At that time the directors, Keith Madden and Dave McAlister, described events leading up to their decision as "an untenable working relationship" between them. 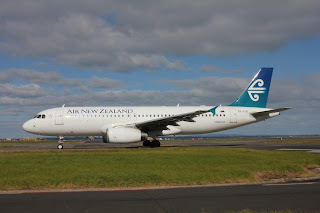 With the closure of the airline an interim Statement of Affairs showed Northern Air to have had a deficiency of almost $100,000 from its estimated asset realisation. 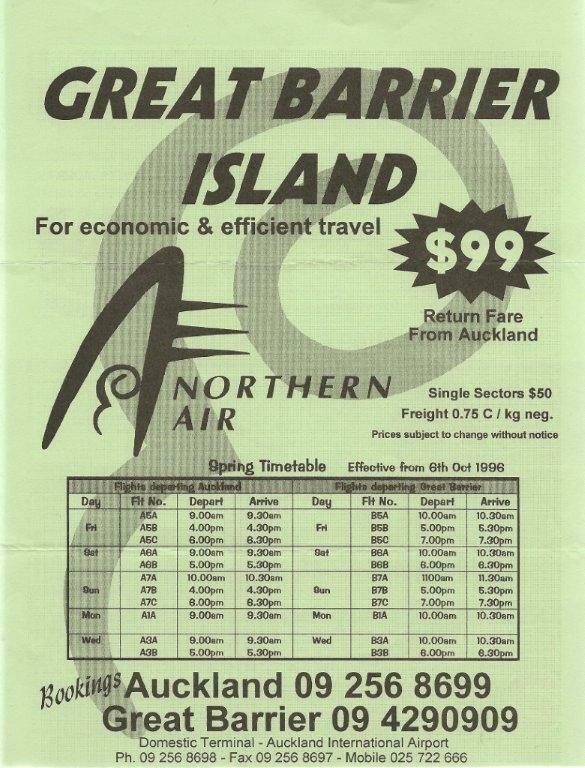 The courier run and some of Northern Air’s aircraft were subsequently taken over by Great Barrier Airlines. 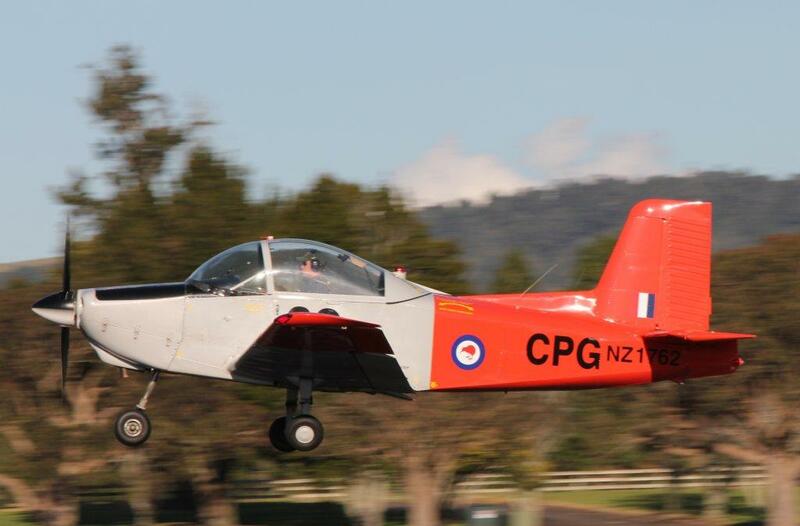 GAF N22 Nomad out at Parakai on 28 November 1996. Bombardier Q300's are set to hit the tarmac for the first time next week at Kapiti Coast Airport as Air Nelson conduct their first training flights in Kapiti. 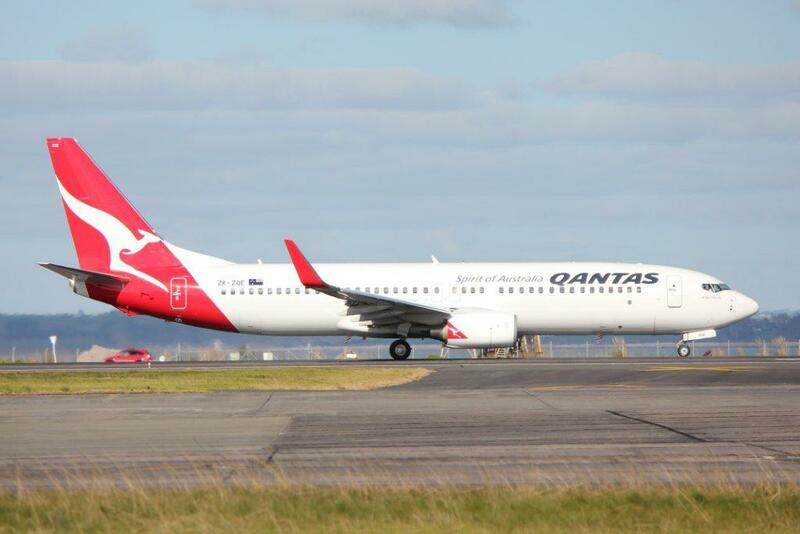 The flights will help Air Nelson crew to familiarise with the new domestic destination, ironing out their flight and ground handling procedures at the airport. 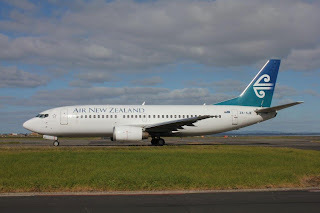 Air Nelson, a subsidiary of Air New Zealand, will run 18 return flights a week between Kapiti and Auckland, starting on October 25, using the 50 seater Q300 aircraft. 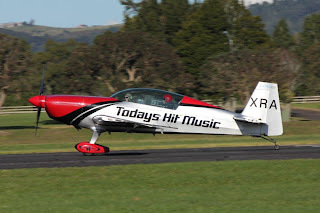 Airport director Sir Noel Robinson said it was exciting to have the planes ready to train at the airport, and comes after plenty of hard work brought the airport up to standard. 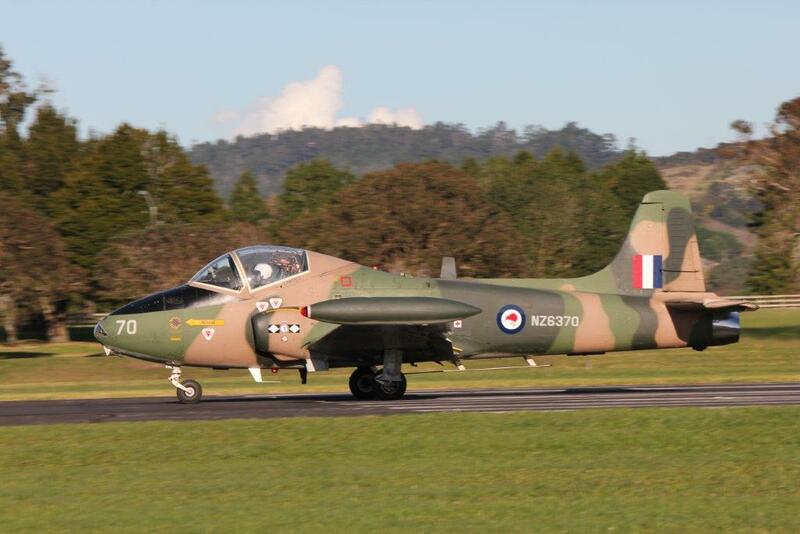 "We've had the runway upgrade, the terminal, all of our systems changing," Sir Noel said. "We are almost there. It is all very exciting." 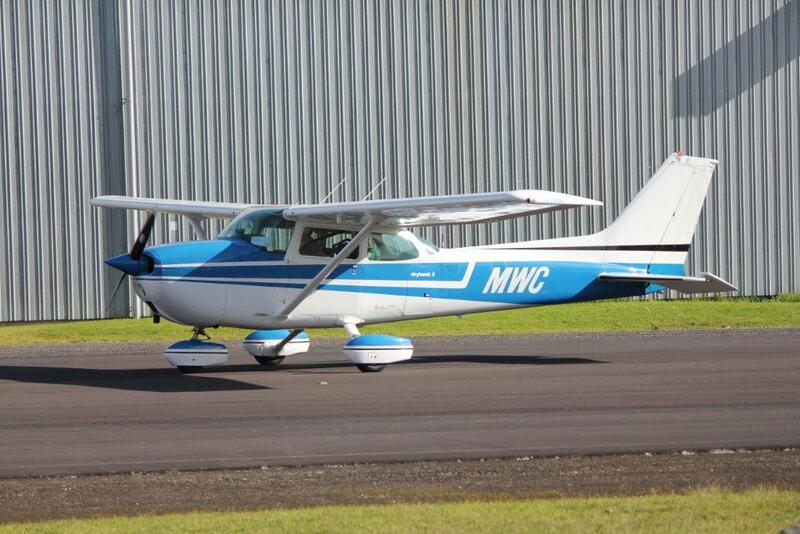 The training flights will be for crew only, no passengers on board. 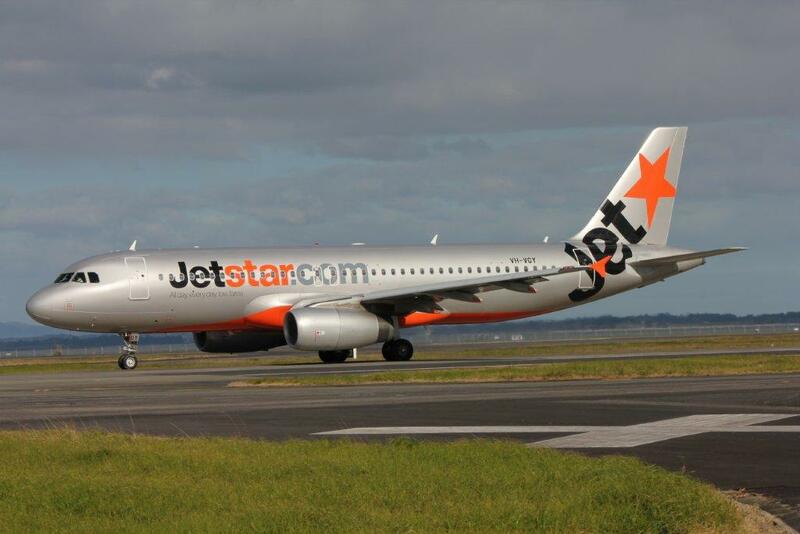 Air Nelson general manager Grant Kerr said when services begin, business people and leisure travellers were expected to snap up the flights. 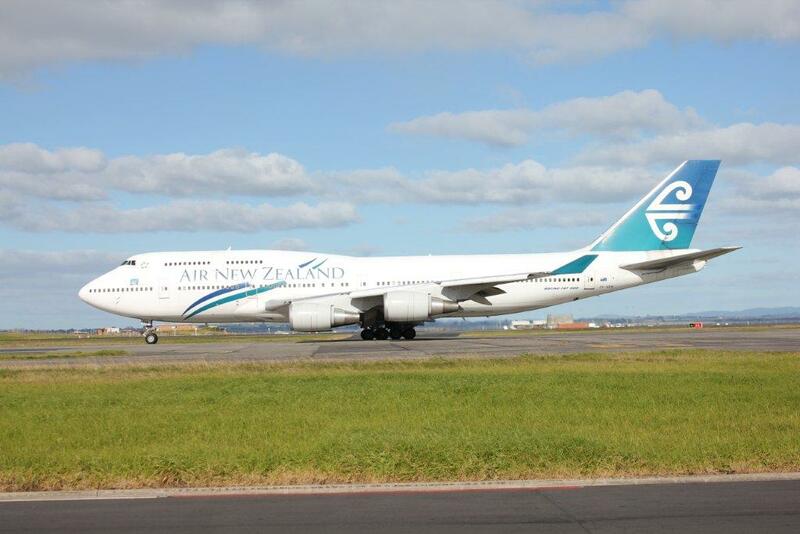 Weekday flights would appeal to business people travelling between Kapiti and Auckland, and to those connecting to international flights out of Auckland. Sir Noel said once flights have started in October work will begin to bring more companies to the airport, improving the aviation industry in Kapiti. "It will bring more interest, jobs. It will boost the economy. We just need to attract those businesses to the airport." The airport company is in the final stages of negotiations with five businesses to lease space in a new building, near Mitre 10 Mega. Chief executive Steve Bootten said discussions were delayed after the Christchurch earthquakes, with the nationwide businesses having to deal with Canterbury issues. He confirmed that a Foodstuffs company would be opening a "mini- market" in the new building, but could not name any of the businesses who would take up leases. "We should be able to announce that fairly soon," he said. A new air service has been set up to serve the Darwin – East Timor route, with Timor Air now offering a daily service, using SAAB 340B aircraft. Timor Air’s administration headquarters will be based in the capital Dili, with Australian and New Zealand company Vincent Aviation providing technical and engineering services to the planes in Darwin. 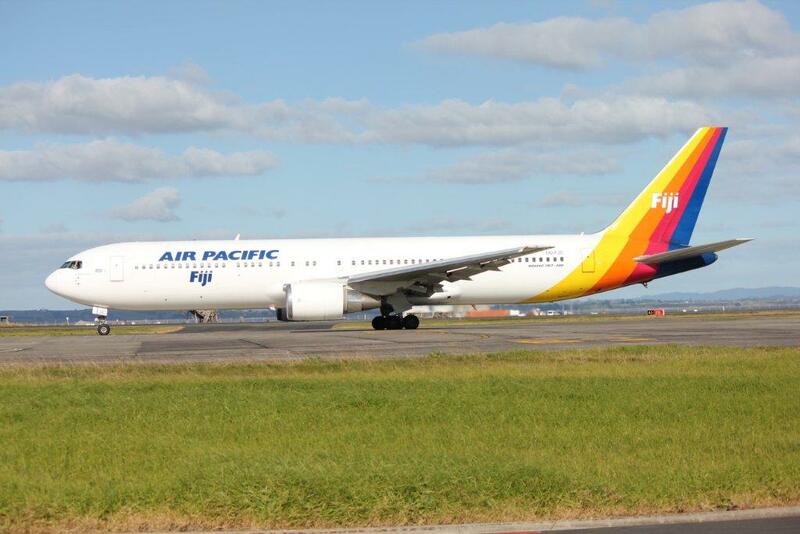 The airline has employed Timorese cabin crew, customer relations officers and ground crew. 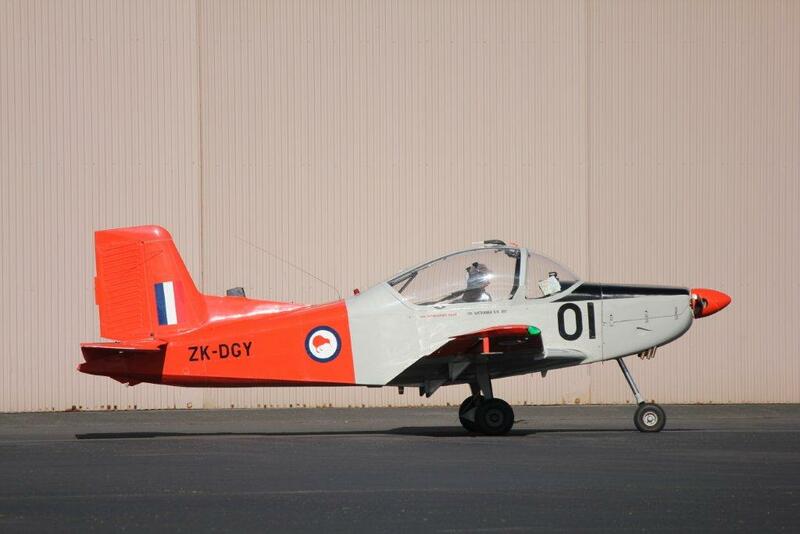 Wayne Grant captured Timor Air's Saab ZK-VAA as it passed through Auckland on the 14th of January 2011. 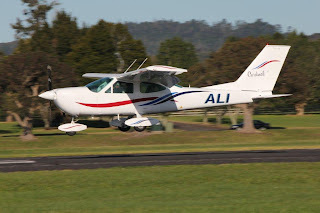 Sunair Aviation Ltd was established in by Dan Power and his wife Bev in 1985. 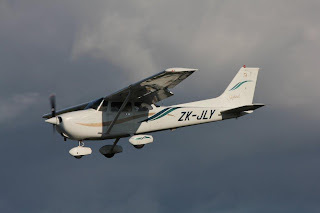 Two years later they applied to the Civil Aviation Authority for an air operator's certificate and commenced charter operations. 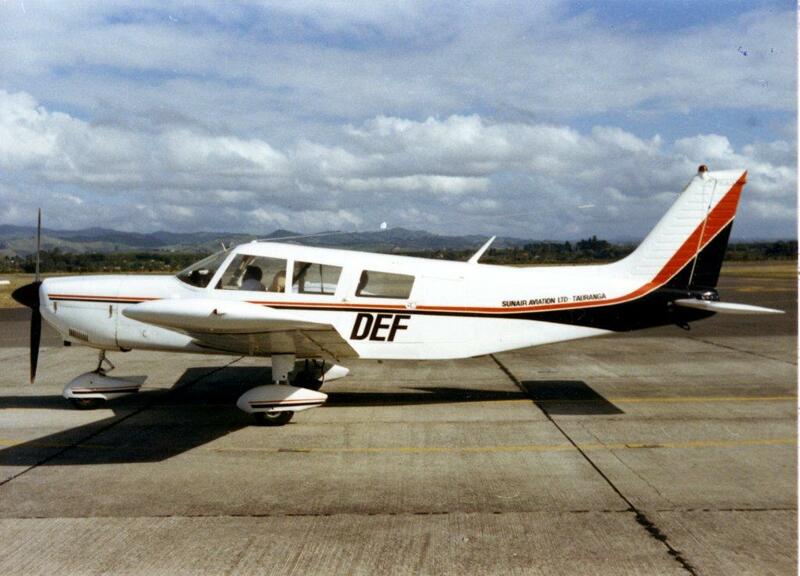 In late 1988 Sunair introduced two air services, a Tauranga-Auckland service using Cessna 402B Utililiner ZK-EHS, (c/n 402B-0217) and a summer service from Tauranga to Great Barrier Island using various single engine aircraft. 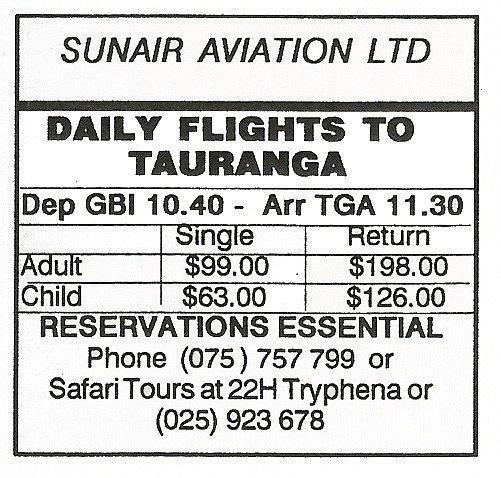 As part of the initial service operated in 1988 Sunair offered a same day shopper service to Tauranga. Generally, however, only one flight was flown on demand in competition with Great Barrier Airlines who were also operating a similar service. Barrier Bulletin advertising in more primitive days, December 1988. Note the telephone number for bookings, 2D! 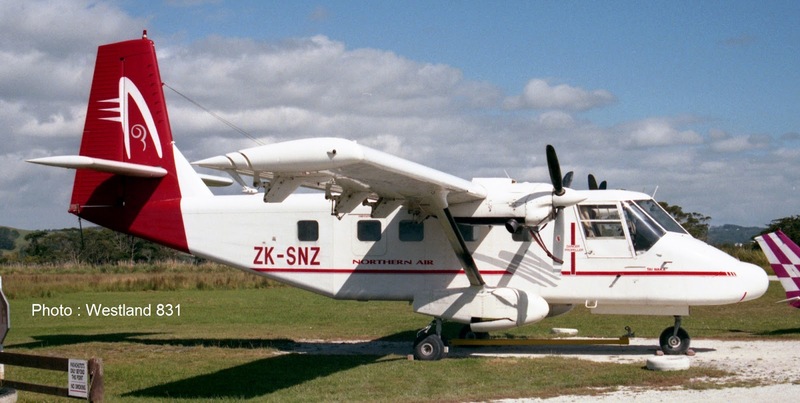 In March 1990 Sunair purchased Island Air Safaris and their Cessna P206 Super Skylane ZK-DRD (c/n P206-0135) and took over their flights from Tauranga to Motiti Island. 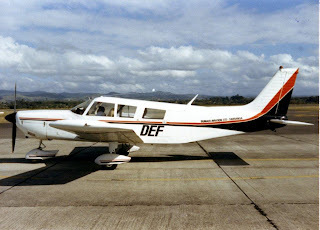 The Motiti Island service was later sold to Island Air Services. 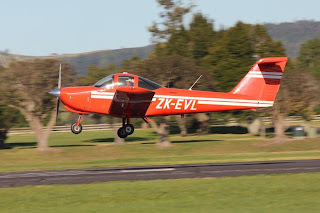 The service was well patronised and in 1991 it was extended by offering stops at Pauanui Beach, Whangamata and Rotorua, flights being offered on a Wednesday, Friday and Sunday to both Claris and Okiwi. 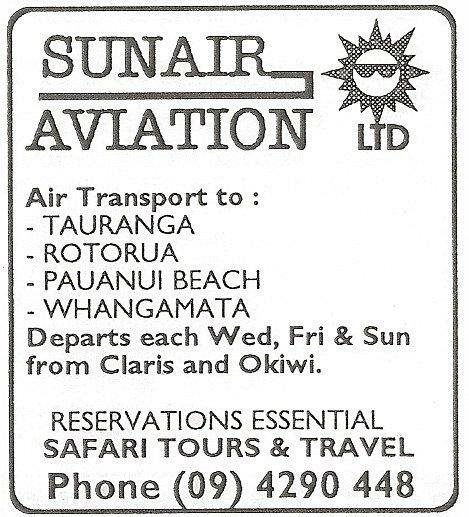 Sunair did not operate the service during the 1992/93 and 1993/94 summer seasons due to a lack of aircraft availability, but on the 16th of December 1994 the service stared again. The flights were offered on a Friday and Sunday. 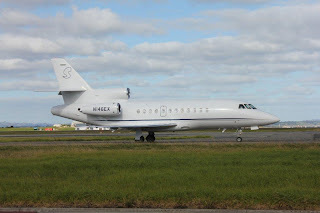 A similar service was offered over the next two summers, with an addition Wednesday flight being offered in the 1996/97 season. 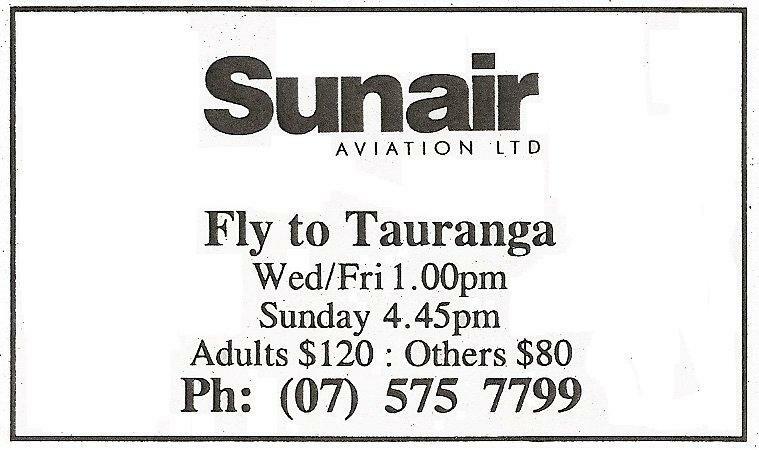 On the 5th of February 1996 Sunair began flights between Tauranga and Napier. Gradually, over the next few years, these were expanded to centres throughout the Central North Island and the development of the twin-engined fleet. 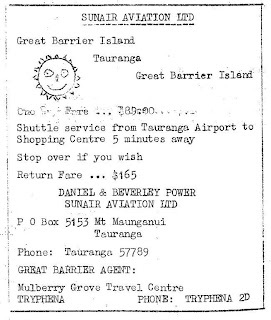 The 1996/97 summer season was the last summer operated to Great Barrier Island for some 13 years. 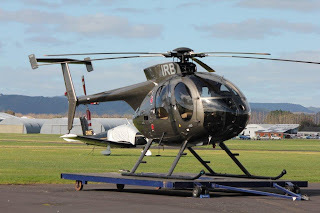 Then, in 2009, it returned to both the centres it had originally served, Auckland and Great Barrier Island, though instead of serving them from Tauranga they were served from Whitianga. 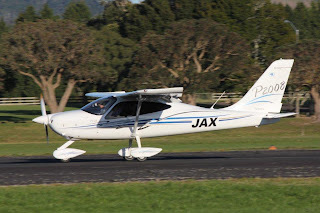 Flights between Whitianga and Auckland were introduced on the 14th of December 2009 using Cessna 172 or Piper Aztec aircraft. 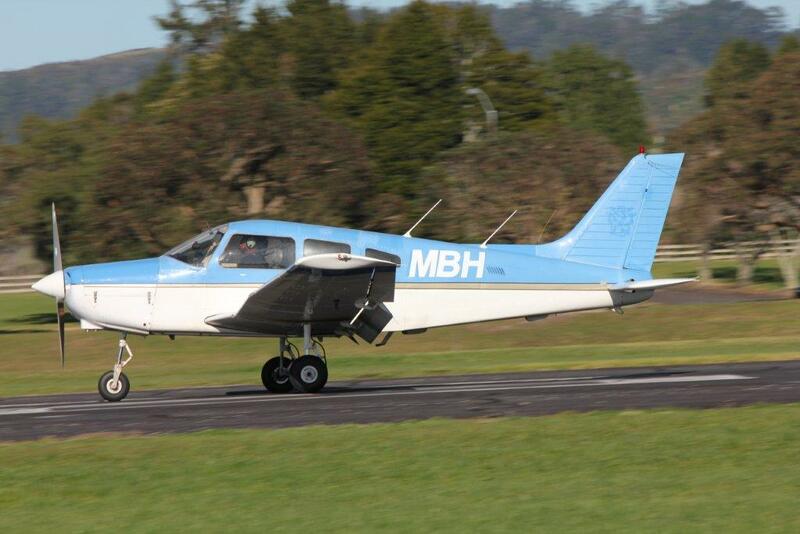 Flights between Whitianga and Great Barrier Island were advertised as being available a few days later with two retrun flights a day being offered. 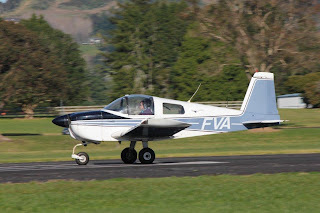 In October 2010 the company expanded their flights out of Whitianga adding Hamilton, Tauranga and Rotorua to its schedule. 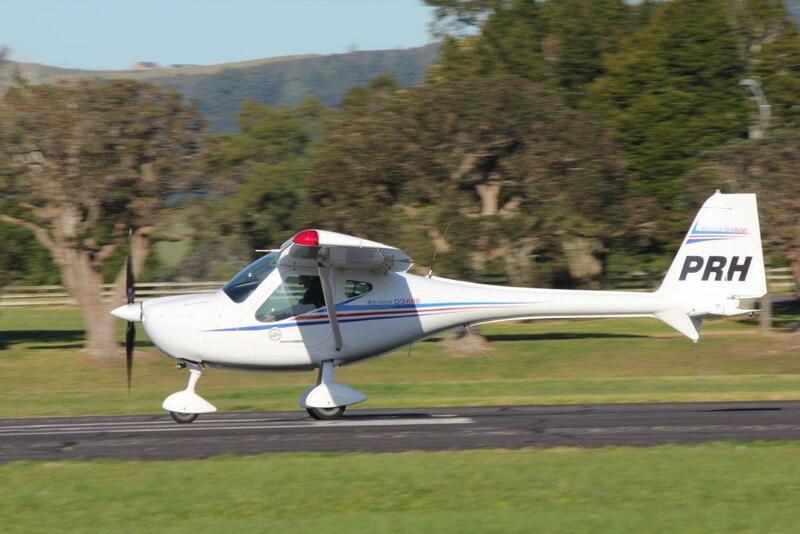 This enabled a link to and from Great Barrier Island to these centres via Whitianga. The Sunair timetable is always indicative and runs more to customer’s requirements than to the times on the timetable. 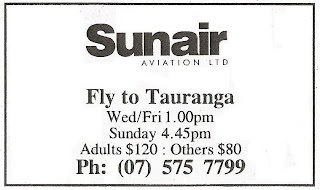 On occasions Sunair aircraft have been noted arriving at Auckland from Whitianga before flying empty to Great Barrier, presumably to pick up passengers for Whitianga. 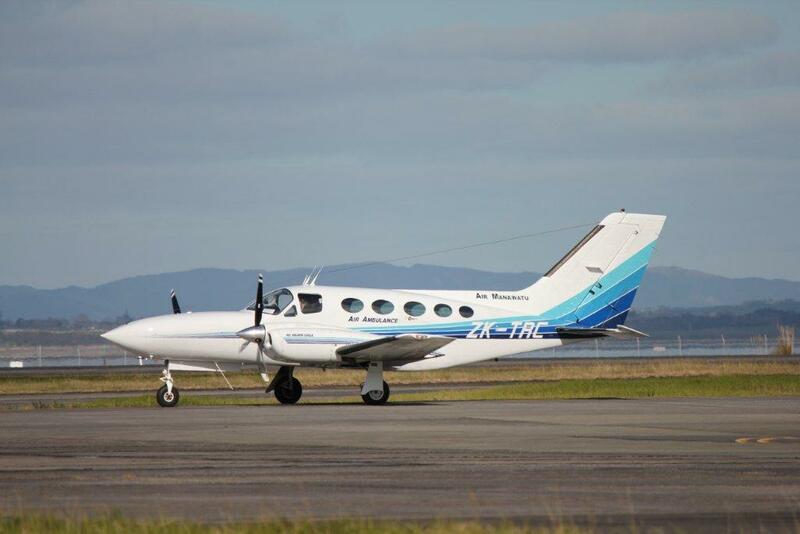 From the 1st of December 2014 Sunair moved the Auckland terminus of its Whitianga flights from Auckland International to Ardmore Airport. 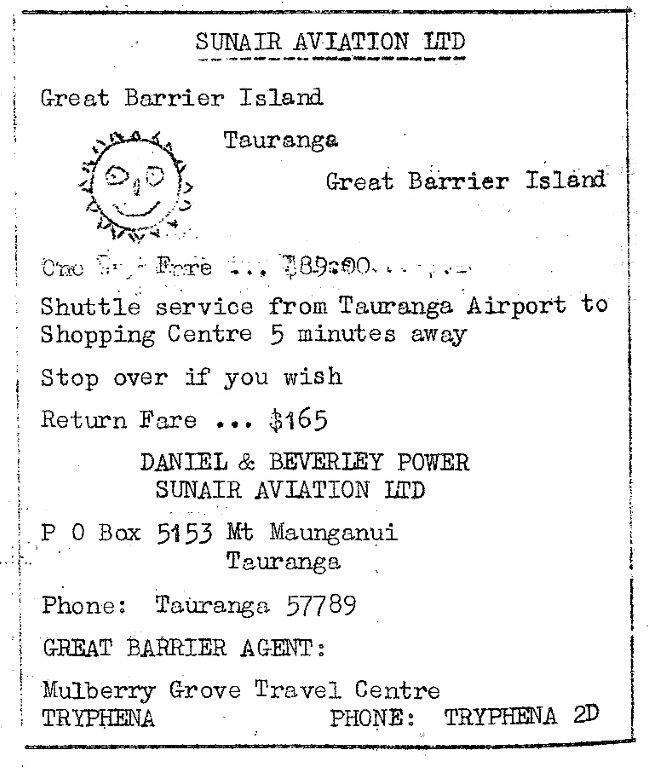 At the same Sunair introduced flights from Ardmore to Great Barrier Island as well as strengthening the Whitianga flights by removing the "two passengers required" restriction before the flights operated. Passengers at Ardmore are able to park for free at Sunair’s secure parking facility, while those arriving from Great Barrier Island or Whitianga who do not have vehicles can choose to either rent a car from the airport or take a $5 regular shuttle to the nearby Papakura train hub. Sunair's first flight operated on Wednesday 3 December 2014, 31 years to the day after Great Barrier Airlines’ operated their first flight between Auckland and Great Barrier Island, Sunair commenced their service from Ardmore. The first flight was operated in Cessna 172 ZK-DHN under the cimmand of Ryan Bergman. The flight left Ardmore at 8.00am, landing at Whitianga before continuing on to the Barrier. Ryan Bergman with the first passenger to Whitianga on the "new" Sunair services on 3 December 2014. 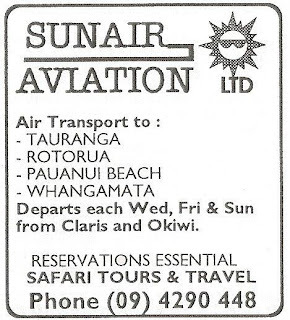 While not a major operator in the Great Barrier scene Sunair has provided an useful service to the Bay of Plenty and Coromandel and the Waikato and a service that is particularly helpful for the many boaties of the area who leave the yachts moored at the scenic spots of this beautiful part of New Zealand. In their first summer of operation the new services from Ardmore to Whitianga and Great Barrier Island proved very popular and from 1 May 2015 these were extended by the offering of two new services between Great Barrier Island and Hamilton and Great Barrier Island and Whangarei. On the same day Whakatane was included on flights to and from Gisborne, Napier and Hamilton. 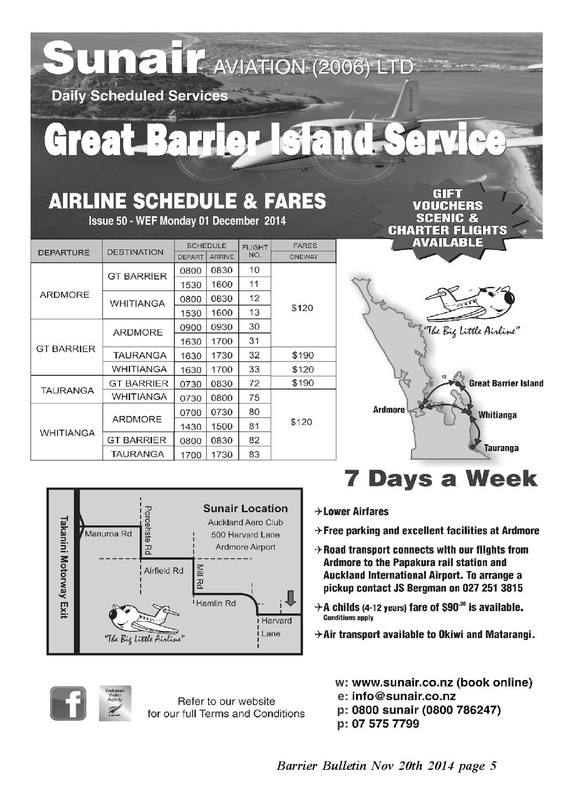 In October 2015 the Great Barrier Island-Whangarei connection was cut due to a lack of patronage. 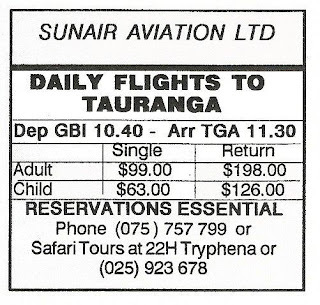 In August 2016 Sunair took over the doctors flights between Whangarei and Kaitaia. 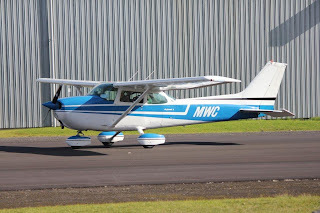 With an Aztec based at Whangarei it seemed logical for Sunir to restart flights from Whangarei and this happened from the 3rd of April 2017 with connections to Great Barrier Island, Hamilton, Tauranga or Rotorua. 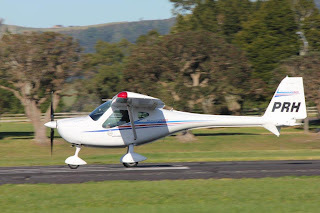 Sunair took over the old North Districts Aero Club building and also announced their intention to offer flight training at Whangarei. On the 8th of September 2017 Sunair Aviation was grounded and it was 203 days before the airline regained permission to resume services. 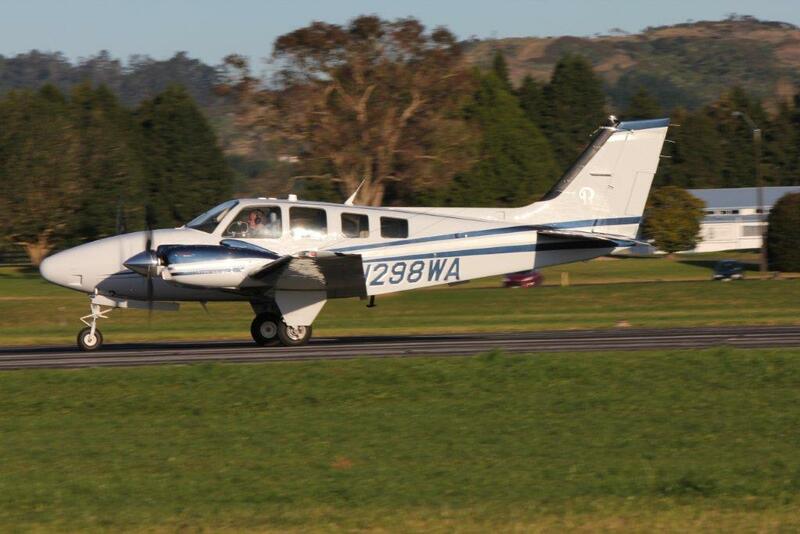 Scheduled services were offered again from the 28th of May 2018 with flights being offered between Great Barrier Island and Whangarei, Whitianga or Tauranga. 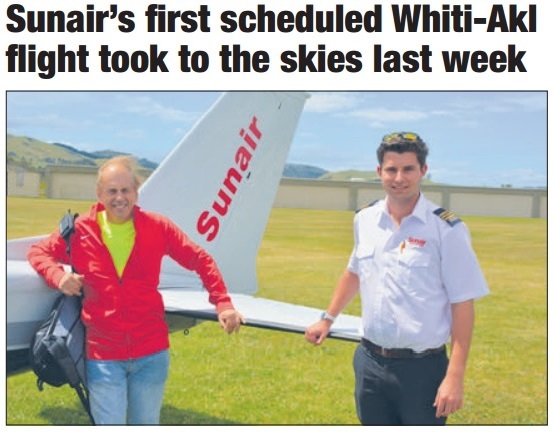 From 4 April 2019 Sunair moved to its winter schedule with flights being offered to Great Barrier Island on Wednesdays, Fridays and Sundays. On the military side, an Airtourer, a Strikemaster and a Skyhawk! A relative rarity amongst training types at Ardmore is the Piper Tomahawk. Taken at Ardmore on 19 July 2011 by S Lowe . 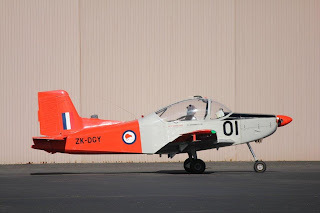 One wonders how long the Auckland Aero Club will keep using their Grumman American AA-1C Lynx aircraft. 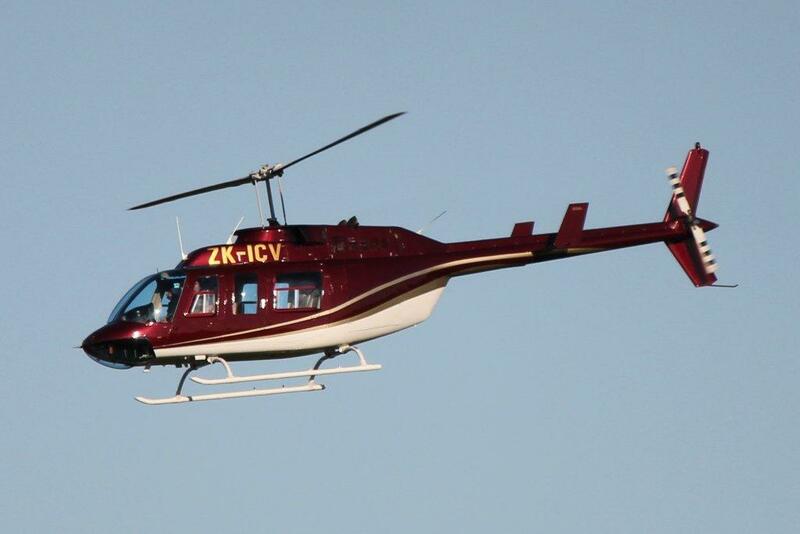 ZK-FVA was busy in the circuit. Taken at Ardmore on 19 July 2011 by S Lowe . Ex Massey Aviation Piper PA-28-161 Warrior ZK-MBH is now with Eagle Flight Training. Taken at Ardmore on 19 July 2011 by S Lowe . 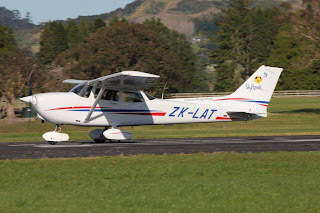 One or Ardmore Flying School's squadron of Cessna 172s, ZK-LAT. Taken at Ardmore on 19 July 2011 by S Lowe . Vincent Aviation Start Greymouth "Service"
Air 2 There at Auckland! Convair ZK-CID on the move - but not far... yet? !